Coffee Cake recipe that you will make over and over again. A buttery cake, topped with cinnamon filling, vanilla cheesecake, and a sweet streusel topping. We love making delicious desserts. 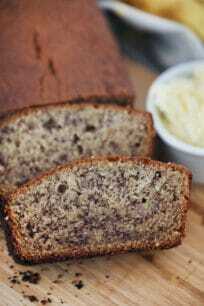 Some of our favorites ones are Blueberry Banana Bread, Chocolate Banana Bread, and Chocolate Banana Muffins. The one and only Coffee Cake recipe you will ever need. This is by far the most amazing Coffee Cake I have ever had. What is not to love, just check those layers: A very tender and buttery cake, that is topped with a flavorful cinnamon filling and after that topped with a creamy cheesecake layer. That is not all my friends, finally, a hefty amount of cinnamon streusel topping, to tie it all together. 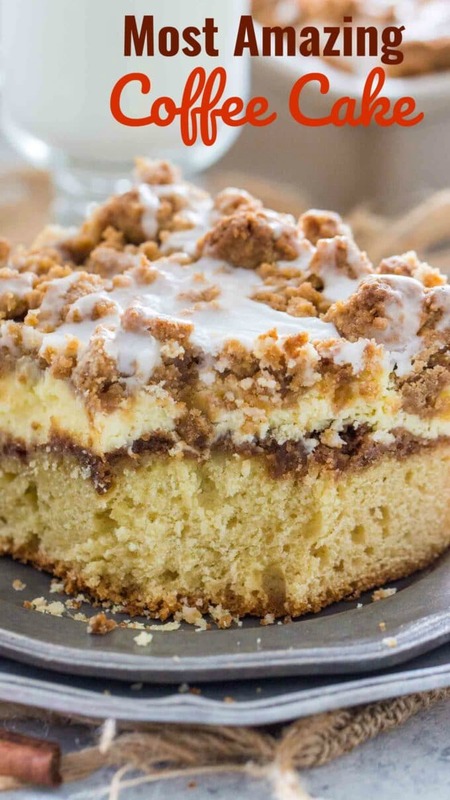 With this Coffee Cake recipe you will become a brunch pop-star, seriously, people may start making a fan group after they have this cake, it’s that good. The cake involves many layers that are all different in texture and make it irresistible! A Coffee Cake is usually a cake that can be served with coffee or its made with coffee. Usually, it should have a streusel topping and some spices like cinnamon. Where did the name Coffee Cake come from? The first coffee cakes are thought to have originated in Germany and they were more like sweetbreads than cakes. How to store Coffee Cake? Freshly baked coffee cake will last for about 1 to 2 days at normal room temperature. While you can store it in the refrigerator, for about 1 week, cover with foil or plastic wrap to prevent the cake from drying out. Can you Freeze Coffee Cake? Yes, to freeze, wrap it tightly with aluminum foil or plastic freezer wrap and it will maintain it’s the best quality for about 2 to 3 months but will remain safe for consumption beyond that time. Thaw in the fridge before serving, you can cut individual slices and thaw them separately, while keeping the rest of the coffee cake in the freezer. How to tell if the coffee cake is bad or spoiled? The best way is to smell and look at the coffee cake appearance, if it has an off smell and you see mold, discard the cake right away. Make sure all the ingredients are of room temperature. It is very important for the butter and cream cheese to be soft, so you can easily whip them. The cream cheese layer aka the cheesecake layer is optional, if you don’t have time, you can just skip it. The coffee cake tastes amazing with it, but its an optional, scrumptious addition. The streusel topping is absolutely delicious, but if you want to cut on some calories, you can make half of it only. The glaze is optional, I personally like to add it because it makes the cake prettier. I used this 9×13 Cake Pan to make the coffee cake and here is the ground cinnamon that I used. Coffee Cake recipe that you will make over and over again. A buttery cake, topped with cinnamon filling, vanilla cheesecake and a sweet streusel topping. Grease and dust with a bit of flour a 13x9 baking dish and set aside. Make sure you use a deep pan, otherwise the batter will overflow in the oven, this is very important. In a large mixing bowl whisk together all purpose flour, sugar, baking powder, baking soda and salt until combined. Using a hand mixer to a stand mixer, beat in softened butter into the flour mixture until all combined and crumbly. Add in eggs, vanilla and buttermilk and beat until fully combined, the mixture should be fluffy. Pour the batter into the prepared baking dish and spread it evenly. In a small bowl, using a for mix together the softened butter, flour, sugar and cinnamon until soft crumbs form. Sprinkle the cinnamon evenly over the cake batter. Set aside. In a large mixing bowl, beat cream cheese , once creamy, beat it sugar. Once combined, beat in eggs and vanilla extract until light and fluffy, about 3-5 minutes. Scoop the cheesecake filling over the cinnamon filling and using a spatula spread it evenly. In a large bowl, mix sugar with cinnamon and salt. Add in the melted butter and combine using a fork. Once the butter is fully combined, add the flour and mix with a fork or using your hands until fully combined. Sprinkle streusel topping over the cheesecake layer until evenly distributed. Bake cake in a 350 degree oven for about 45-50 minutes, until fully cooked. Cool completely and after that refrigerate it for 3-4 hours for the cheesecake layer to fully settle before serving. Add the powdered sugar to a medium bowl, add two tablespoons of milk and the vanilla extract. Mix until fully combined with no lumps. If the mixture is too thick add one more tablespoon of milk. I like the glaze on the thicker side, yet pourable, so it will look white and shiny, not transparent. Use a fork or spoon to drizzle the icing over the cake. Coffee cake is a dangerous thing around me. Once I start eating it, I can’t stop! But with an additional cheesecake layer? I’d have no chance at all. I’m afraid I will try it, though. It’s my duty. I love how this is not just a wonderful recipe but that you taught us a bit about the history too! That is so cool! The layers do look scrumptious! I adore coffee cake mostly because of the CRUMBLES! Yummm! That looks divine! It’s funny that you explained if there is coffee in coffee cake because for the longest time, I thought for sure there was coffee in it haha. The great thing about coffee cakes is that with or without coffee, they’re back still yummy! Haha. I’m going to try this recipe. 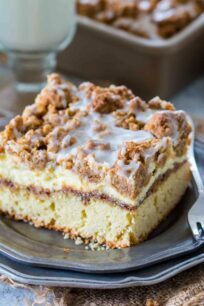 Coffee cake is one of my favorite things to have for breakfast! This looks so good!! I have to bring a dessert to Easter. My brother is serving brunch…maybe I will make this!! I cannot get over how appetizing this coffee cake looks. I have had coffee inspired desserts and I haven’t had one I didn’t like. I am surprised it is named coffee cake but doesn’t contain any coffee for flavoring. I would absolutely eat that again and again! It looks so moist and delicious! I love all the crumb topping, that’s my favorite part! Oooh, and the cheesecake layer! Genius! This is the perfect snack for a lazy Sunday, lounging with a good cup of coffee. Hmm, coffee cake! Definitely one of my weaknesses! I’m not a huge fan of sweets, and mostly choose chocolate but I can devour a coffee cake on any given day. I think I figured out why I love them so much…the cinnamon! I LOVE cinnamon!! I gotta admit I’m not into coffee — but coffee cakes I can tolerate. This one for instance looks amazing and probably tastes amazing too! I should probably try my hands on this one since I bet my sister would love it too. Thanks! Love that layer of cinnamon! I have to make this! this is exactly how i want to start every day! Coffee Cake is my favorite kind of cake, yes even more so than chocolate! This one sounds so moist and delicious! I have to give it a try! This looks just like the coffee cake my grandma used to make for us! So delish! Looks very good. Question – Is the recipe correct in stating 4 8oz pkgs of cream cheese. That’s enough to make a cheesecake alone. Should it be 4 3oz or maybe 2 8oz? I used 4 8 ounces packages, I know its a lot, but you can see that I used a large pan, so I wanted a thicker layer, thats why I used that much, I am a sucker for cheesecake! You can totally use less, you can use 2 8oz packages, one egg and half the sugar. I made this cake yesterday using a Pyrex 13×9 glass baking dish. During cooking, the coffee cake pushed up the cheesecake layer and it overflowed the pan’s boundaries and made a mess in my oven. 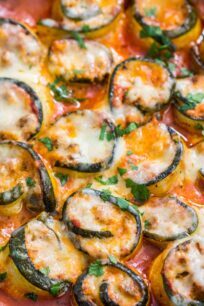 What kind of baking dish do you use and what are the dimensions of the sides? Did anyone else experience this? Believe it or not – I still served it and the people loved it, but I hesitate to make it again because of this issue. Comments PLEASE!! Hi Nadine, I am sorry you had that accident, I know how annoying its to clean the oven, sorry. I actually link in the post to the exact pan that I used: OXO Good Grips Non-Stick Pro Cake Pan 9 x 13 Inch – the sides are taller than an usual cake pan, so I never had the issue with batter overflowing. Mine overflowed too. I used a copper 9×13 and thought it was deep enough. I will however make this many more times as it’s beyond delishous! I’ll just adjust the ingredients a bit or make an additional mini coffee cake. This looks so fantastic! 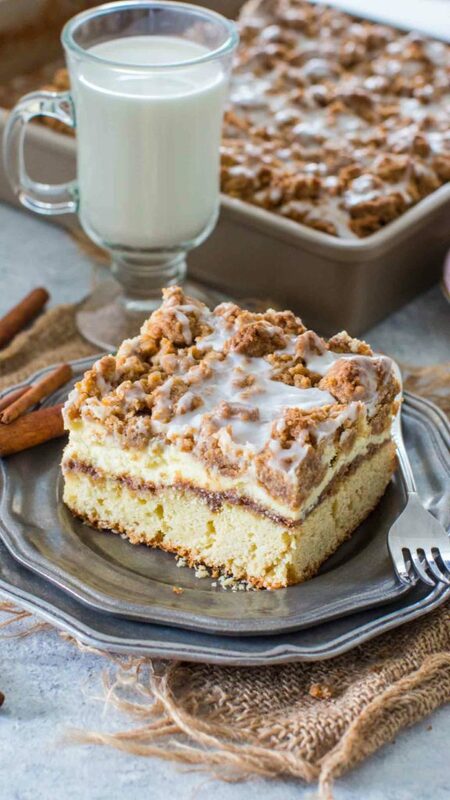 I adore coffee cake, and this looks so so good. I always use buttermilk – it makes it so tender!! Coffee cake is one of my favorite things! This looks delicious! This looks amazing! I’d eat this for breakfast any day! This looks great, it’s always a challenge to find a good coffee cake recipe. Do you think it could be made without the cheesecake layer? Yes, totally, just skip it! I love this recipe. It will not last long with me and my husband! I see the cheesecake layer calls for 4 packages of the cream cheese. I might find that a bit much, so I will cut back by half and see what happens. Hopefully it does not just get drowned out, but I get the feeling that it should be fine. Can u make this cake the night before? Then bake the next morning? yes, you can, make sure your pan is deep enough (like the one I used) if you are making all the layers, as it will overflow in regular pans. Great and easy cake to make, turned out delicious!! wondering if when you stick a cake tester into this cake after baking will the cream cheese layer still show marks on it and it settles in the fridge or will it be a dry tested with a traditional cake. Want to make sure mine is fully cooked. Smells so good baking! Thank you! When you insert the cake tester it will have crumbs on it, but you have to look for the cake raw batter. Mostly, you have to check the edges, sides of the cake, if they are golden brown. This cake looks A-MAZ-ING! I’d love to try it. However, where I live there’s no buttermilk. Would it be okay to substitute it for regular milk? Is there a better substitute you know? This cake looks so good!! I have an event this weekend and wanted to know if would be able to make this in a bundt or tube pan? it makes a lot so you may have enough butter to make it into two bundt pans. This is my new go-to coffee cake recipe! Super moist even days after making. VERY flavorful. Couldn’t be improved! I am so happy that you love it! Thank you! This looks amazing! I want to make it this week but can it be frozen for a few days? I don’t know if anyone has done that or not..I would prefer to serve it freshly made but won’t have the time to do it on the day I need it. This looks amazing! I want to make it this week but my question is can it be baked ahead and frozen? Not sure if anyone has done that or not. I don’t have time on the day I need it to bake it so I wanted to do it a couple of days in advance but also keep it fresh. Hi Michelle, yes, these can be easily frozen. Wrap it tightly in plastic wrap and after in aluminum foil. Did you change the recipe to 2 packages of cream cheese instead of 4? I thought it said 4 the other day when I went shopping. I just want to make certain 2 is right and will turn out ok with the other ingredients as listed. Thanks!! 5 stars…Absolutely delicious! This came out fabulous, although my struesel topping was very loose so the glaze fell off with it while serving. Excellent recipe! I used a standard regular pyrex dish and two packages of cream cheese and though it puffed slightly above the sides of the pan, it did not overflow. If i were to make it again I’d cut the cake ingredients in half so the cheese cake layer was in better proportion … which is probably why the recipe first had 4 pkgs of cream cheese… but my husband disagreed and said it was perfect as is. Perhaps he is right, since it is a coffee cake after all. I also didn’t let it rest in the fridge because I’m impatient and it was still yummy. Anyway, easy to follow recipe and excellent flavors. Thank you! I made this today and it was really out of this world! I just did the cake and topping, no glaze or cream cheese frosting. People go make this! It really is the BEST coffee cake recipe! 5 stars!!! I just made this and it looks and tastes wonderful which is good because this is not the easiest coffee cake I’ve ever made. 5 bowls, two mixers, 3 spatulas later…. I followed the recipes exactly, but since I was taking it to a brunch, I made it in a disposable, deep 13 x 9” pan. Because they tend to be flimsy, I baked it on a cookie sheet. Don’t know if that is why I had to bake it for 70 minutes. I couldn’t tell if it was truly done then until I used an instant read thermometer to see if center was at 210F. At 50 minutes cake was still visually wobbly, so I knew it wasn’t done. Since it tastes great, easily cuts into clean slices and actually resembles the photo in the recipe I gave it 5 Stars. Just make sure you have plenty of time (and bowls!) to prepare (room temperature eggs, butter and cream cheese), baking, cooling and refrigerating. This is not a cake to make on the fly but worthy of a special occasion. * Instead of a deep 9X13 (which I dont have), I used a 10X15 pan to hopefully avoid spillage as it bakes. *Substituted 1/2 C whole wheat flour and the remaining 2 cups of all purpose. *The cinnamon layer makes a TON, I ended up only using half and saved the rest to use with the streusel topping. (Next time Ill just reduce the entire layer recipe by half). *I think that the amount of cheese cake filling the 2 packages makes was perfect for the size pan that I used. Any less and it would have been not enough to cover the cinnamon layer. I can see why this recipe would have spillage as it bakes, even with a deep 9X13! *I took the remaining cinnamon mixture and added a 3/4 C all purpose flour, more cinnamon, and half stick of melted butter. Worked out great! Ill update the post after its done baking and we’ve tasted it! Is it possible to use self raising flower instead of regular flower and baking soda? I haven’t tried it this way, bit I don’t see why it wouldn’t work. whew!! Just finished making it—its a bit labor intensive creating 4 layers for it-cake, cinnamon filling, cream cheese filling and streusel… but it is SO good!!! I used a regular type of 9×13 cake pan and it was FILLED to the brim. So, make sure you’ve got enough depth for all that goodness.? My husband is lactose intolerant, but loves his desserts, so many of our favorites contain cream cheese. 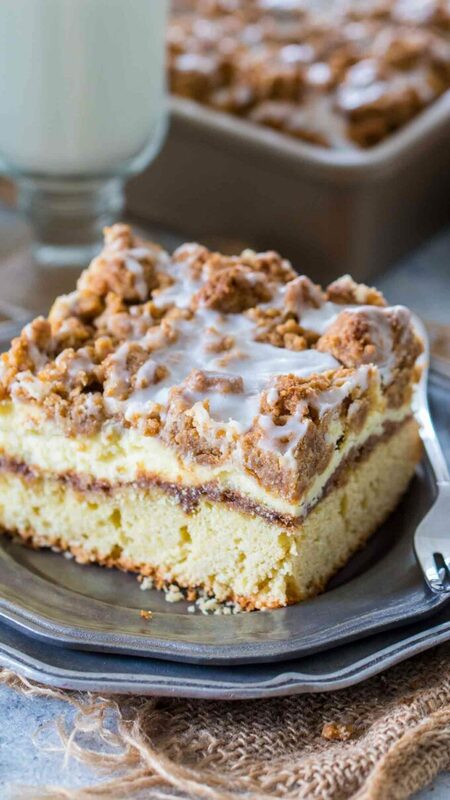 Can you suggest a good substitute for the cream cheese filling in this coffee cake? to make the cake but seeing the video might have been fun. Where is it? What do I click on to see it? Could the problem be that I have an Apple desktop computer running Google Chrome as the browser? Right before the recipe it says: BEST EVER COFFEE CAKE RECIPE STEP-BY-STEP VIDEO, thats where the video is. Maybe your connection is slow and its not loading, sorry. Why are people giving 5 stars without having made this? It’s really misleading and frustrating for people like me who are looking for honest reviews. Please don’t review something if you actually haven’t tried it. Sometimes people get excited when they see something that they like, but this is a great recipe. I promise you will love it. I absolutely love cream cheese, but I’m wondering if the cheesecake layer might be too heavy in the morning for breakfast. Since I’ve never tried this recipe, would you say that it’s a little on the heavy-side or still a light-tasting cake even with the cream cheese? 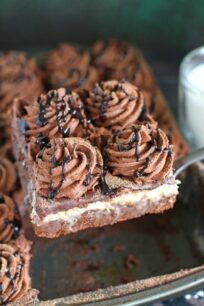 I would definitely NOT call this a light cake, it is rich and indulgent and worth every calorie. The cheesecake layer is NOT too much, its actually very thin and just adds more flavor. Hi! I haven’t made this yet and just was wondering, if you were to leave out the cheesecake layer, should you still put cinnamon in between cake? I’m just unsure if that would work. Yes, you can still put the cinnamon and it will taste delicious! 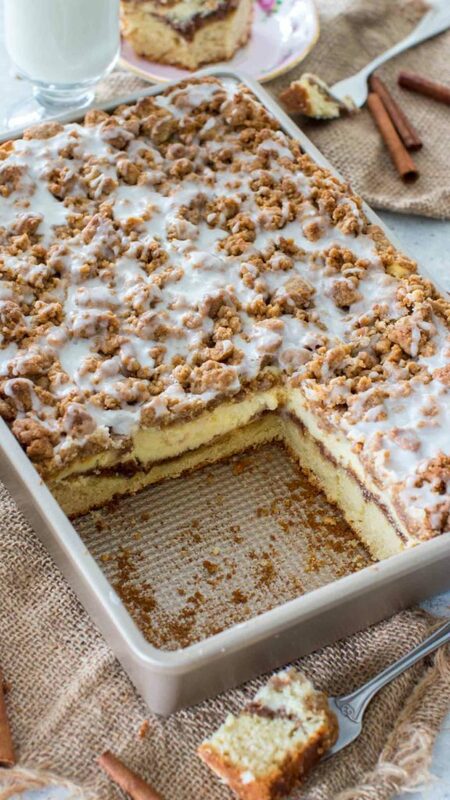 Hi 🙂 How do I ensure that the streusel topping doesn’t go soggy? I find that mine goes soggy after keeping the cake in a container overnight. thanks!! If you wrap it tightly in plastic wrap and after that, in foil, it should keep its texture better. It gets soggy usually from the humidity and condensation. Can this be left out overnight, or does it need to be refrigerated because of the cheesecake? Made your recipe. It’s just out of the oven . It looks great but hard to tell if cake bottom is cooked. Any other ideas for that? How do you store this cake? I usually wrap mine and leave it on the counter but this recipe has a cheesecake layer. Do you store it in the fridge? Yes, cover it and store it in the fridge. Help!!!!!! In the middle of maming this coffee cake and I accidentally mixex cream cheese layer ingredients together at the same time! I don’t have time to go buy more cream cheese. How can I fix this!! My bowl looks like a soupy mess. Need to be at my Mother in Laws in 2 hours!! Can I make these in muffin form? I’m going to my best friends baby shower and they requested coffee cake muffins and I stumbled upon this recipe and thought it looked awesome!! I’m just not sure what to adjust the time to and I also don’t know how many it would yield. I am not sure how many it will yield, but probably a LOT 🙂 the cooking time would be about 30 minutes.